The Cat’s Meow toy will save you more than just your furniture and money. It also saves you time. Cats are independent creatures, but when they are ready for some interaction, it’s usually advisable to do what you have to do to make time for them. Otherwise, the meowing is just going to get louder. When you do need an extra half hour to finish dinner or fold the laundry, turn on the Cat’s Meow. You will be able to finish up, and your cat can work on getting rid that extra energy before the sun does down and it’s bedtime. Battery operated Cat’s Meow™ toy operates anywhere your cat likes to play – you’ll enjoy hours of fun watching your cat & mouse! Let your kitty enjoy hours of fun! 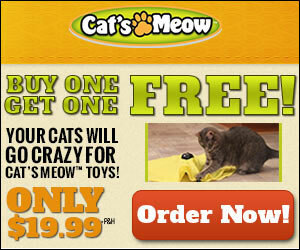 • A second Cat’s Meow™ toy for FREE*!